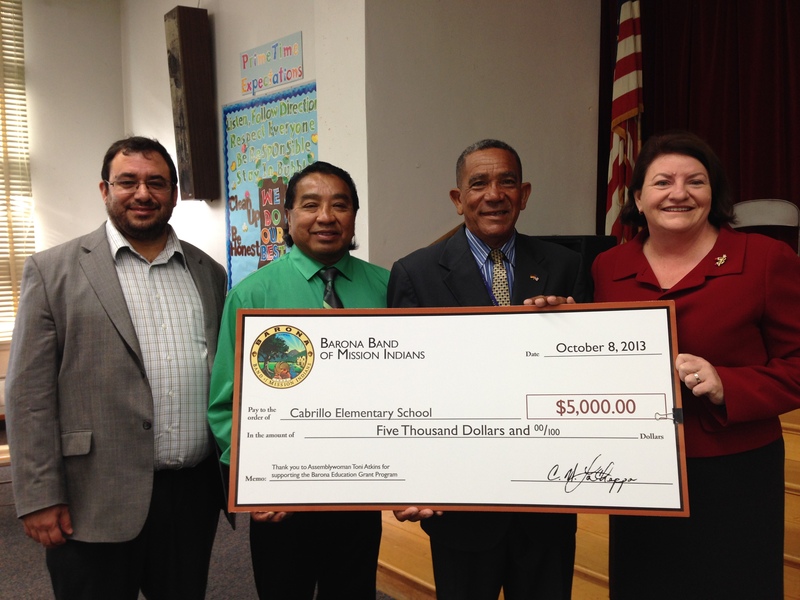 Barona Tribal Chairman Clifford LaChappa presents a $5,000 Barona Education Grant to Cabrillo Elementary School in Point Loma. 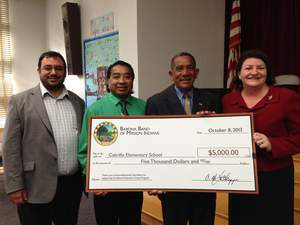 SAN DIEGO, CA--(Marketwired - Oct 10, 2013) - Students and educators from Cabrillo Elementary School received a $5,000 education grant today from the Barona Band of Mission Indians. The school's grant application was sponsored by Assemblywoman Toni Atkins whose district includes Point Loma. The school, located in the La Playa neighborhood of Point Loma, is one of the oldest schools in San Diego and serves students in grades K-4 from military and civilian families. As the cost of classroom textbooks continue to increase and are often an economic burden on families, Cabrillo Elementary will use the grant money to purchase dozens of new textbooks and lesson books. "The Barona Band of Mission Indians is proud to provide these bright young minds with access to educational materials that help put them on the path to success," said Clifford LaChappa, Chairman of the Barona Band of Mission Indians. "Many of our schools are in need of fundamental teaching tools such as books and our program has been instrumental in helping to fulfill those needs at schools across the state and right here in San Diego." The program is the first of its kind in California created and administered by a Tribal Government. The goal of the program is to create strong educational opportunities for the children of California building upon the success of the Barona Indian Charter School, which operates under a continuous improvement model. Schools throughout California can apply for educational grants from Barona to purchase much-needed supplies and materials that promote academic improvement. Each grant awarded by the Barona Education Grant Program is $5,000. Applications can be downloaded at http://barona-nsn.gov/education.